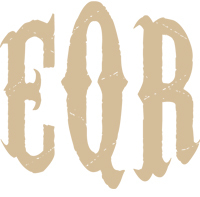 Equine Quick Response, LLC (EQR) is very excited to announce the upcoming equine event: Celebration of the Horse. This event will take place on May 31, 2014 at the Crossroads Cowboy Church aka Two Bar Two Arena in El Paso, Arkansas. The first event kicks off at 9am with Arkansas’ state recognized equine specialist, Steve Jones. Steve will be conducting a training clinic during the morning hours entitled: From the Ground to the Saddle. During this event, several volunteers will be bringing in their horses who may be experiencing various types of training issues. 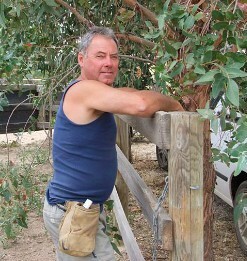 Steve will work with each horse and rider individually to assist in resolving their issues. There are still a few slots remaining and those interested in participating in this free clinic are encouraged to register (see the form below). Steve will also start the afternoon session by presenting a saddle fitting demonstration. During the afternoon session, a competitive trail clinic and competition will be held. ACTHA Ride Host, Kay Carmody of the J Bar K Ranch in Hartmon, AR, will provide instruction regarding a selection of approved competitive trail obstacles and tips for successfully performing such obstacles. Volunteer participants will then perform the obstacles in front of the audience, and will be judged and scored by ACTHA Judge, Kirk Davis. Ribbons will be awarded based on horse and rider scores. Participant slots are still available but filling fast. Those interested in participating in this free clinic are encouraged to register using the form below. 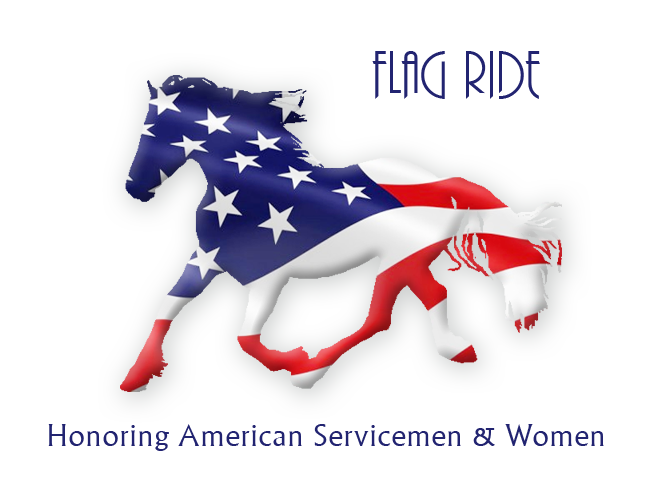 Not only will this one day event be host to two great clinics, the entire day is jam packed with topics of interest to a variety of horse enthusiasts. Entertainment will be provided by Bullseye the Rodeo Clown and his dog, Jester. Music will be performed during the lunch break by area favorite, Rodger King. 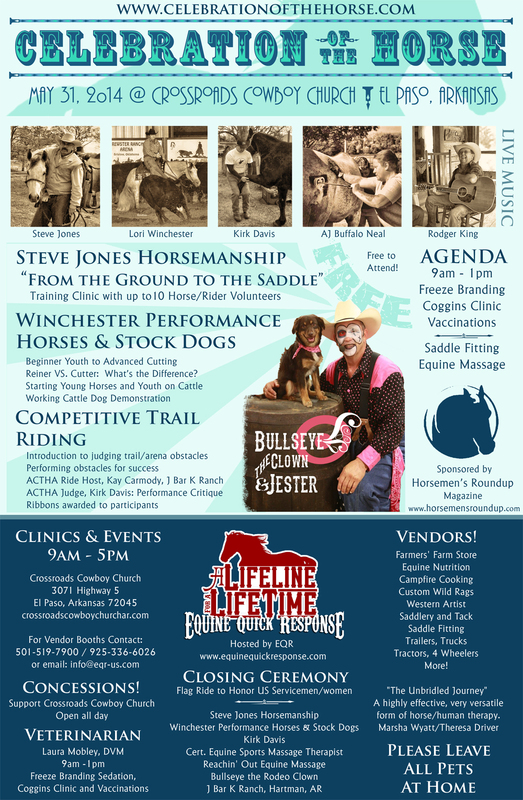 Rusty and Lori Winchester of Winchester Performance Horses, of Searcy, AR, will present two great exhibitions: Cutting Horse Demonstration with Winchester Performance Horses (cutting buffalo) and a Working Cattle Dog Demonstration. Other demonstrations on the schedule include Freeze Branding by AJ Buffalo Neal and Equine Sports Massage Therapy by Kirk Davis. Equine Nutrition Counselor, Lisa Evans will be available for discussions in the Equine Services area, as well as a Coggins / Immunization Clinic from 9am – 1pm by Laura Mobley, DVM. Come for the fun, the entertainment, education or inspiration. Or bring your horse for coggins, immunizations, freeze branding, saddle fitting, or massage. It will be a great day of equine activities the entire family is sure to enjoy, entry is free! 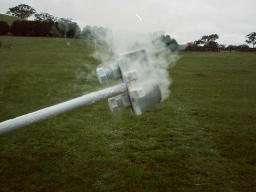 Freeze branding is a method of visibly and permanently identifying horses and ponies. Freeze branding, as the name suggests, is carried out by freezing the brand using liquid nitrogen to -196c and then applying to the skin for 6-10 seconds. This destroys the hair pigment so when the hair grows back it is white. White or grey horses will need a slightly longer application; this will destroy the hair follicle which will result in a hairless brand. 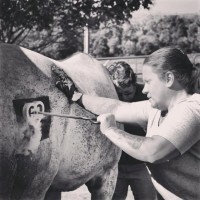 A small area on the animal’s shoulders is clipped and methylated spirit is applied to the clipped area, the brand is then applied. The horse/pony may be walked in a small circle or stand quite still while the brand is being applied. They react differently but most times barely notice what is going on. Even foals cope well with this process. The final product, Wadelee Obsession* shown here 3 months later with his beautiful freeze brand. The brand swells up after it is applied, but this swelling subsides within a couple of hours. The branding application is virtually painless to the animal. The coldness of the application will help to act as an anesthetic; however the initial effect can cause slight discomfort. 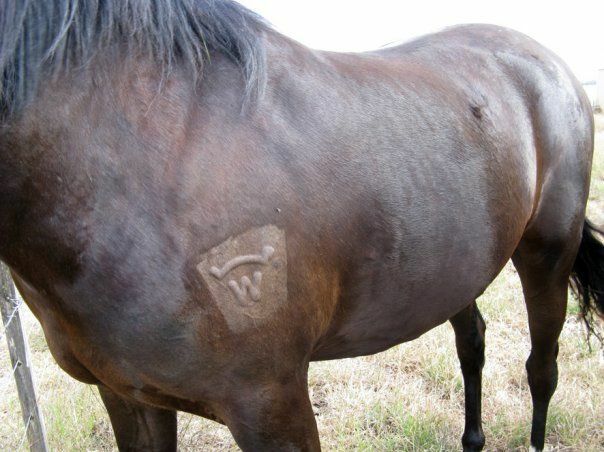 Many horses can be branded with little or no restraint but of course we don’t usually know which they are until after the brand has been applied. All efforts are made to make this process as stress free as possible for animal, handler and brander. As this application does not break the skin and does not cause ongoing discomfort your horse can be ridden, rugged and fed as normal. How long before the brand shows? Freeze branding is humane and therefore a gradual process. At first there will be little to see, then the old hair will die away and the new hair will grow through in the shape of the brand. This will take approximately 4 – 6 weeks. 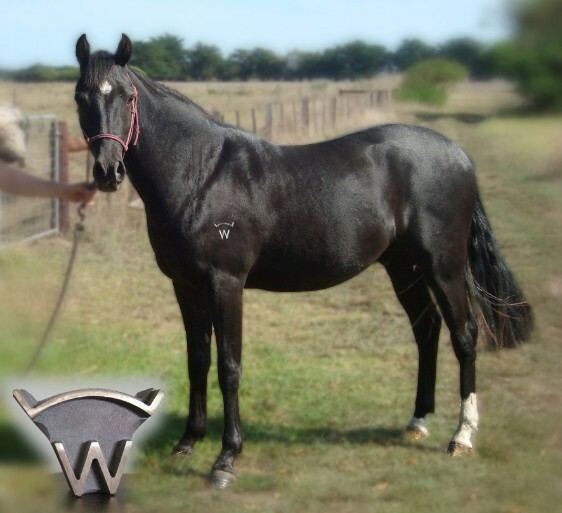 Tony Carter-Smith has 25 years experience freeze branding horses. He works under contract to freeze brand and take DNA samples of all standardbred foals in Victoria, Australia, as well as the majority of the thoroughbred studs. “Here in Australia all thoroughbreds and standardbreds (harness horses) must be freeze branded with registered brands and micro chipped. This is recorded on national and state databases. Many other breeds are also freeze branded and micro chipped and their brand is recorded by their own horse association or society. We have a national/state microchip register. Many people freeze brand their pleasure horses with unregistered brands but it serves the purpose of giving identity. In the southern states of Australia, most working horses are freeze branded now but in our larger states there is still some hot branding, mainly due to tradition, lack of liquid nitrogen in remote areas and cost. Tony brands all types from Clydesdale to miniature and everything in between. He brands all standardbreds in this state and 75% of the thoroughbreds so this time of the year is busy for him. Probably the biggest difference we notice is that the brands in the USA are enormous compared to ours. Most Thoroughbred brands here are only one 1″ inch, which grow a little after application, but this gives a clear clean brand. Our brands are actually manufactured in Texas, it took them a while to figure out how we could use such “itty bitty” brands. *Wadelee Obsession is owned by Courtney Schleter & Jessica Herring of Wadelee Pony Stud, Mt. Gambier SA.